A Graduate Field of Horticulture PhD candidate has created a work of art along Tower Road to celebrate commencement and say thank you to the friends, family and fellow students who helped him through his time at Cornell. 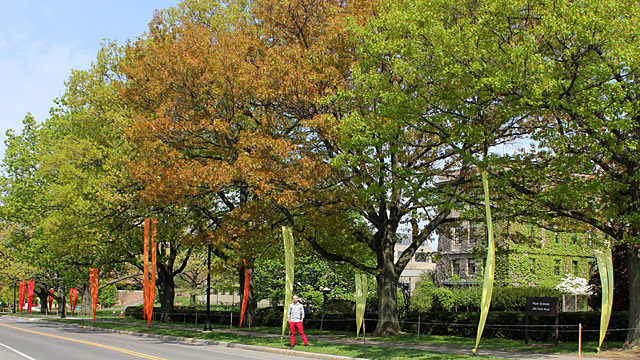 After more than four months of planning and securing permissions, Paya and fellow horticulture grad student Miles Schwartz-Sax spent 12 hours Saturday stretching the yellow, orange and red banners from branches in the oak trees to the ground adjacent to Minns Garden and Plant Science Building. Paya says he was inspired in part by the feeling he gets walking through underground tunnels at airports. “I love corridors – the way they lead you on – and I love trees,” says Paya, whose dissertation explores the belowground interactions of tree roots from different species. 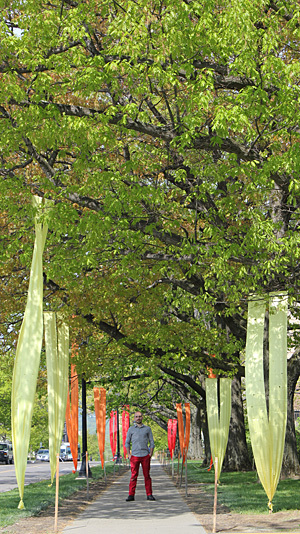 “So my intent was to create a space to lead people forward only in a more natural setting. “I tried to create something novel, interesting and festive – with the fall colors contrasting with the background of spring,” he adds. The installation is ephemeral. 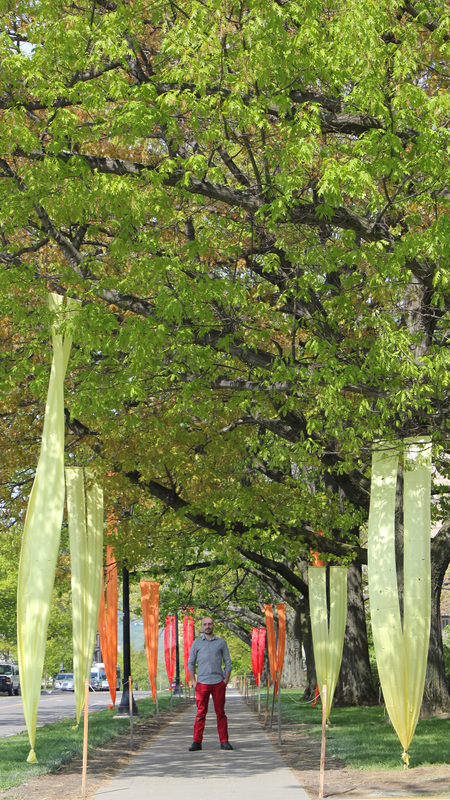 Paya plans to remove the banners in early June. Paya would also like to thank fellow students in the Graduate Field of Horticulture Juana Munra Ucis, Marie Zwetsloot, Adam Karl, and Sonam Sherpa for their contributions to the project.